There have been very few times in my life when I've been a trend-setter. Typically I'm several years behind the trends, only to finally catch on as everyone else is moving on to the next big thing. I just bought my first pair of skinny jeans this year, for example. And most recently, I've become addicted to the now-defunct show, Gossip Girl. It is mindless, smutty, and totally ridiculous, but it is my new guilty pleasure. I blew through way too many episodes yesterday, and finally finished the first season... when I should have been folding the mountain of laundry, cleaning the bathrooms, and/or any of the other million items on my never-ending to-do list. But Blair and Serena were calling my name, and I couldn't resist. Did anyone else watch Gossip Girl, or am I alone in this one? Another thing I'm late to the party on: gnocchi. I'd ordered it in restaurants a few times, but never used it in my own cooking. It is super easy, and while I do plan on making it from scratch soon, the vacuum-sealed packages are great in a pinch. I love serving it with bolognese sauce, brown-butter sauce with various veggies, and now this one-pot cheesy gnocchi with broccoli and chicken. It is embarrassingly easy, a hit with our whole family, and actually not too sinful - especially since it's basically glorified mac and cheese. I almost always have all the ingredients on hand, so this is a perfect last-minute meal, or something to whip up when other dinner plans fall through. 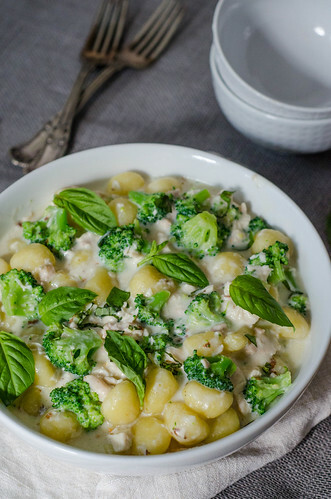 My kids love broccoli, and combined with shredded chicken, tender gnocchi, and creamy mascarpone cheese, this is a killer combination. Bring a large pot of salted water to a boil. Add the gnocchi to the water and cook until they rise to the surface, about 3 minutes. Add the broccoli and continue to cook an additional 2 minutes. Remove from heat, drain, and rinse the gnocchi and broccoli with cold water. Drain well and set aside. Return the pot to the stovetop, and over medium heat, add the milk, garlic, and cayenne. Bring to a simmer and stir in the mascarpone and Parmesan until the cheeses are melted. Reduce the heat to medium-low and cook a few more minutes, or until the milk-cheese mixture is slightly thickened. Add the chicken, gnocchi, and broccoli and stir well to combine. Season to taste with salt and pepper. Remove from heat and allow to sit 10 minutes before serving (this will help thicken the sauce). Sprinkle with basil and serve. Haha, I used to love Gossip Girl! I watched it while it was airing, but binge watching is the best. I wish my husband liked gnocchi more, this looks like amazing comfort food! I loved Gossip Girl and then lost track at some point. I need to start it back up - even though sadly I know who GG turned out to be :( Oh well! XOXO! PS - This sounds fantastic! Never seen Gossip girl, but this looks like my kind of meal! I started watching Gossip Girl last fall (I'm 32) and found myself ending emails with "xo xo" and painting my nails ridiculous colors :). I'm planning on watching the whole serious again this winter since I have a newborn keeping me up!! Amazing recipe. I made gnocchi the other day and made wayy too much haha. Perfect way for me to cook it :) thanks for sharing! PS Gossip Girl is one of my all-time faves. The cast is just too gorgeous! This was my first recipe I've tried using yeast and these cinnamon rolls were amazing. Delicious and picture perfect. Wonderful directions and easy to follow. This is amazing! I live in Taiwan, so some of the ingredients I can't get here. I replaced the chipotle with little red chiles we have here and added a chopped yellow onion to the sweet potatoes. It was divine. Spicy, sweet, savory. My roommate and I can't stop raving about it. I will definitely be making it again! Wonder if you could use ricotta? That's what I happen to have on hand.